Yes, that’s correct: what the news in the U.S. tells you about Denmark’s population being so happy truly is a load of crap, and the answers to fixing the broken U.S. social and financial system cannot be found there. Many Danes don’t often see polls with the claims mentioned here. Just like us, they read news articles detailing national political infighting, pollution from pesticide runoff, and work-related stress, along with the small victories around the country; and mentioning polls about how happy Danes are elicits a rolling of eyes and comments about the ridiculousness of such claims. The basic principle of the Danish welfare system (economy), often referred to as the Scandinavian welfare model, is that all citizens have equal rights to social security. Within the Danish welfare system, a number of services are available to citizens, free of charge. 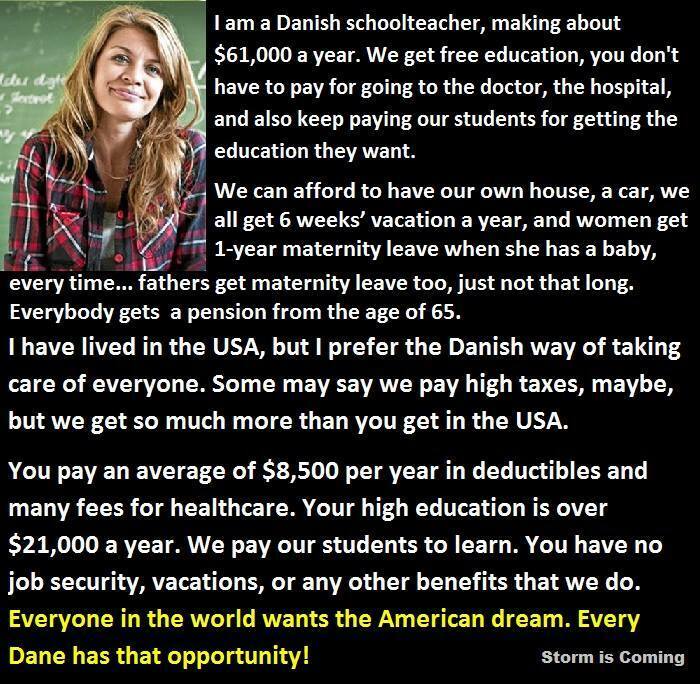 This means that for instance the Danish health and educational systems are free. The Danish welfare model is subsidised by the state, and as a result Denmark has one of the highest taxation levels in the world. The Danish tax burden is one of the most heated areas of politics that you can discuss here and honestly writing about it is like trying to eat an elephant at one sitting. With income tax averaging from 58 to 72 percent, car taxes more than 180 percent and a stiff 25 VAT (value added tax) added to all purchases – it can be sometimes difficult to bring home any bacon. Danes have to pay more for just about everything. Books are a luxury item. Their equivalent of the George Washington Bridge costs $45 to cross. Health care is free, which means you pay in time instead of money. Services are distributed only after endless stays in waiting rooms. They’re also world leaders in alcohol and anti-depressant use. Visitors say Danes are joyless to be around. Denmark suffers from high rates of alcoholism. In its use of antidepressants it ranks fourth in the world. Denmark’s productivity is in decline, its workers put in only 28 hours a week, and everybody you meet seems to have a government job. Denmark’s suicide rate has been about twice as high as the United States over the past five decades. According to the INTERPOL data, for murder, the rate in 2000 was 4.03 for Denmark, 1.10 for Japan, and 5.51 for USA. What do they do with that free education? Too many pursue “fulfilment” and too few the science and engineering degrees needed in well-paid growth sectors critical for the nation’s future. Typical is 23-year-old Ali Badreldin, who is enrolled at the Royal Danish Academy of Music to become a saxophone player. “Music was always part of my life growing up so it was a natural choice,” he said. His courses are free and he gets a monthly stipend of 5,839 DKK ($1,074 USD) in a system where class sizes are rarely limited. The result has Denmark spending more proportionally on education than any other country in the OECD club of 34 advanced nations and getting less return.. Yet biotech firms like Novozymes say they cannot find enough engineers. Engineering opportunities have soared in recent years in Denmark, but its youth have shunned the sector, with only one-third the OECD average contemplating an engineering career amid top-heavy enrolment in arts and humanities programmes. Unemployment Rate in Denmark remained unchanged at 4.50 percent in December from 4.50 percent in November of 2015, however official Denmark rates include those actively seeking employment, The more realistic rate is closer to 7.50 percent to 9.50 percent. You can take out unemployment insurance with an unemployment insurance fund (a-kasse), which are private associations related to the trade unions and other professional organisations. Believe it or not, the minimum wage in Denmark really is $20 per hour. Many minimum wage increase opposers will say that it makes everything else more expensive. In a nutshell, yes, it can. However, it’s not always an immediate spark of inflation. Either way, it’s important to note that Denmark actually is an expensive country. In fact, Copenhagen is among the five most expensive cities in the world. A meal at McDonalds in Denmark is around 65 DKK, which is $11.89 . In the United States, the same meal is $6.50. The price of regular gasoline gallon/$USD as of today is $5.93 a new low due to the world market. A Volkswagen Golf will run you $45,747.33! That will buy you a real car here. Pair of Levi 501 jeans, or equivalent, $134.46. Single parenting is common in Denmark. The country has the fourth highest divorce rate in Europe, far outstripping the UK, and the latest figures from Statistics Denmark show that 42.7 per cent of marriages ended in divorce. Like so many things in Denmark that is escalating, According to Statistics Denmark, the national divorce rate jumped by 23 percent last year when compared to the previous ten-year average. Healthcare is becoming too expensive for even their extortionate tax rate to subsidize. New rules are coming into effect which will apply to people who wish to use private hospitals versus the state run ones for certain operations. It has been a growing trend to use private hospitals for operations when the waiting times were too long at state run hospitals. Instead of waiting up to a year for a hip operation, you could get it at a private hospital within a month. You paid the fee and got reimbursed the cost from the health service. Well that is changing. Now many operations will not be paid for at private hospitals. There is talk of operations for knees, shoulder, eyebrows, back and weight problems. This list will probably grow as the government tries to reduce costs more and more. Denmark’s low cancer survival rates of 50.9% are a double-edged sword, as the nation has the highest cancer rate in the world. According to the World Cancer Research Fund, Denmark has 338 cancer patients for every 100,000 residents. So, why are they so happy there? I read it in a meme! The glorious Denmark meme MAY have been somewhat true it the past, but it is rapidly declining in the current days. Partially due to the flaws inherant in the socialist dreamscape, but also now an added factor that the rest of the world has been facing. It’s off the charts and Demark is risking heading down the drain. Some “experts” and pro-immigration politicians – like the UN chief of Migration (who is also chairman at Goldman-Sachs bank) claim that the influx of Syrian refugees and migrants from the Muslim world will benefit European economy. That is a very bold statement when you look at the statistics. Muslim refugees (in this case from Lebanon) are the most criminal group of all. Syrians, whom the European elite wants us to believe is highly educated refugees eager to work and contribuite, is the group that is most unemployed. “Male immigrants and descendants from Lebanon have the highest crime rate of all ethnic groups in Denmark. According to the latest available figures (from 2013) the Lebanese male crime rate is index 254 – even when adjusted for age and socioeconomic status. If you do not adjust for this, the figure would be even higher. Danish men’s crime rate is index 98. Lebanese also perform poorly on the labor market. The employment rate for 30-59-year-old Lebanese immigrants is 30.4 percent, while the employment rate for ethnic Danes is 82.3 percent. The figures for the employment rate cover both men and women. In turn, their descendants are not included in these figures, but also when you look at the group of descendants of Lebanese immigrants, there is a significant under-employment. Refugees and immigrants from Lebanon are a special group, since many are stateless Palestinians with growing up in refugee camps. This is not the case for the Iraqi immigrants, but the crime index for Iraqis is also high. Among the Iraqi immigrants (and refugees), only 32.8 percent of 30-59-year-olds had a job in 2013. It is only marginally better than the Lebanese. The crime index for male Iraqi immigrants and their descendants is as high as for the Lebanese, but with an index of 166, when adjusted for age and socio-economic conditions, the crime index for Iraqi refugees and migrants is still well above average. Danish lawmakers, this last session, passed a controversial bill aiming to make the Scandinavian country a less attractive destination for refugees and migrants. – New, more difficult citizenship requirements approved by the government earlier this week. – Police will be able to search migrants’ luggage and seize cash exceeding 10,000 kroner (1,340 euros, $1,450), as well as any individual items valued at more than that amount. Wedding rings and other items of sentimental value will be exempt. – Refugees granted a lower form of protection status under Danish law, meaning people fleeing indiscriminate violence rather than individual persecution, have to wait three years instead of one year before applying for family reunifications. Once the application has been filed, the process can take years. – New family reunification rules that will include tougher restrictions for “foreigners who have poorer preconditions for becoming integrated into Danish society” and easier rules for “foreigners who are consider to be suitable for integration”. – Tighter rules for obtaining permanent residency that will require foreigners to “meet a string of fixed conditions and some supplementary integration-relevant criteria” in order to obtain permanent residency. Additionally, the proposal calls for scrapping the “particularly easy access” to permanent residency for refugees. – For permanent residency applications, Danish language requirements have been raised from Danish 1 to Danish 2, and the person must have been employed for 2.5 of the past three years rather than three out of five years. – Tougher citizenship criteria for children who were born in Denmark to foreign parents. The proposal entails scrapping more lax requirements that were implemented by the previous government in 2014. – More focus on a refugee’s ability “to contribute” when Denmark chooses its 500 UN quota refugees each year. These changes were introduced by Integration Minister Inger Støjberg in August. – A proposal to apply the newly-created ‘integration benefit’, a sharp reduction in the benefits given to refugees, to even more foreigners. – A proposal to implement recommendations from the Criminal Code Council (Straffelovrådet) to change Denmark’s current laws on treason so they can be applied to Danes or foreigners who engage in armed conflict abroad. This has turned into a longer thought rant that I had anticipated, so if you want more information, Google it yourself, just avoid the “warm fuzzy” liberal sites and seek the truth. Oh, yeah. Shove that stupid meme! And fear this flake, fear him very much! Source: Denmark vs United States Background Stats Compared and around the web. Follow me on Facebook for more unfilted truth!